This flower-like image shows a plant that is not developing quite right. It comes from a study in which scientists at EMBL and the University of Sydney unearthed the molecular feedback loop that creates the spiral pattern of leaves around a stem. The work is published today in Current Biology. For centuries, artists, biologists and mathematicians have been inspired by the recurring patterns of the plant world: the exquisite symmetry of flowers, the sweeping spirals of seeds, spines and leaves. The plant in this image, however, has gotten its spiral wrong. Instead of several leaves spaced out in a spiral pattern, it has two continuous, spiral-shaped organs developing. How do plants create such amazing patterns? Based on mathematical modelling and computer simulations, scientists know that if plant organs like leaves or petals are produced at regular intervals, these complex patterns can automatically emerge. So how do plants produce organs at regular intervals? Biologists knew the answer involved cells in the growing plant coordinating with their neighbours to transport the plant hormone auxin to sites where it accumulates. At each auxin hotspot, a new leaf begins to grow. But how are these hotspots formed and maintained? Neha Bhatia, a PhD student in Marcus Heisler’s lab at EMBL, found that if a cell detects a lot of auxin, it makes neighbouring cells transport the hormone towards that cell. This creates a hotspot. At the same time, it depletes auxin levels in the surrounding area, so another hotspot can only form a fair distance away, where that cell’s influence is no longer felt. This, the EMBL scientists conclude, is what creates the regular spacing between auxin hotspots, and consequently between leaves. 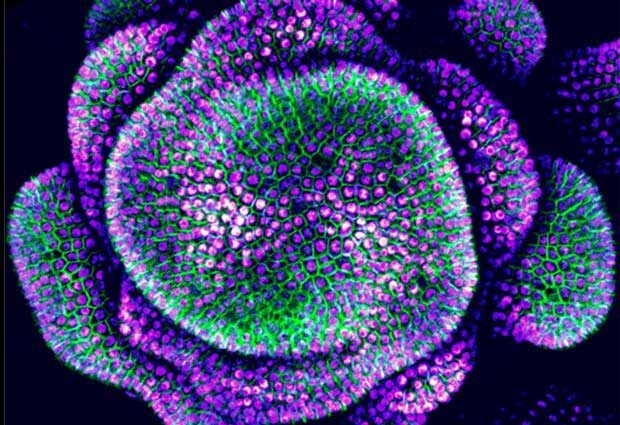 Surprisingly, Bhatia found that this feedback loop has to be active not just in the cells on the surface of the growing plant, but also in the cells below. If only surface cells can respond to auxin, the auxin seems to build up too much and starts to leak sideways. This gives rise to the wonderful spiral shaped organs in the picture. The EMBL scientists speculate that this could be what happens in some species of Cereus cacti, whose leaves are spiral-shaped.